As I mentioned in my last post, we have a stone house in Hungary. This is actually rather unusual as most old rural houses in Hungary are made of adobe or brick. However, even with our stone walls, dirt is used between the stones, not cement. This is not a pile of rocks. This is one of the external walls of our house after the old plaster was removed. The rocks are stacked together only with dirt between them, not cement. Because of the stone and dirt construction, the house has to have a protective layer of plaster to prevent weathering. The old plaster was crumbling so it had to be removed and a new layer added. In the above photo, the plaster from the entrance space before our wine cellar room has been removed. You can see the old plaster still on the upper house still undergoing removal. After removal, the plaster is reapplied, first to the bottom parts of the house, below the first floor, then to the upper half of the house. In the above photo we have had added plaster to the pre-cellar room and lower part of the house. 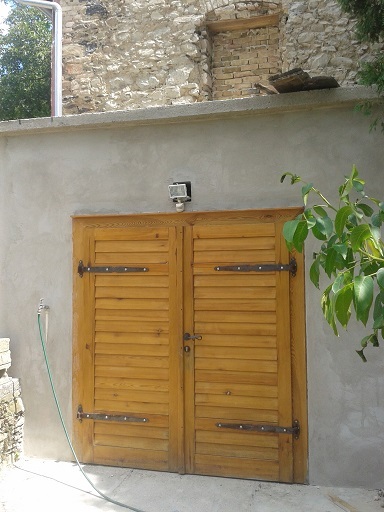 Front view of the cellar door and pre-cellar plastered. A final external colored plaster will be added in the fall. During plaster removal, we also found a hidden door space. Which has a nice bowed arch (disabled in the past for some reason with a piece of wood to fit a long ago removed square door). This type of little gem really adds possibilities to renovating. A nice entrance from the house can be made to the small deck above the pre-cellar room. A door opening found when we removed the plaster from the main wall above the pre-cellar. The door frame has an arched header, which was apparently hidden and not used by the last square door. The weather has been too hot to plaster the rest of the house. Will add more photos and dialog when the weather cools and we can progress further.